I’ve been researching various oils. For more about Rapeseed Oil, Grapeseed Oil, Canola, and Olive Oil, see the article here. Coconut oil’s going mainstream- it’s even at Trader Joe’s. And red palm oil hit the headlines, thanks to Dr. Oz. But what’s the truth about red palm oil (the unrefined, bright red version, not the refined stuff that makes junk food junky). Red palm oil is loaded with carotene; it’s in a good form too, as carotene needs fat in order to be assimilated. It also contains lots of other nutrients (and I mean, lots), including super potent forms of Vitamin E. Red palm oil contains all four of the different tocotrienols, which have 60 times the antioxidant activity of our typical “vitamin E”. The tocotrienols increase blood flow to the brain and slow damage done by free radicals (aiding in Alzheimer’s and dementia prevention, too). Yay! Another feature: even though red palm oil is a saturated fat (solid at room temperature), it has been proven anti-inflammatory, removing plaque build-up in arteries. Without a plaque build-up, less cholesterol collects in the area. The presence of cholesterol is not actually the cause of heart disease, but a symptom of a problem. And while it’s quite profitable to sell cholesterol-reducing drugs to address that symptom, how much better would it be to address the real problem?! An anti-inflammatory diet could probably do much to address heart-disease problems, and red palm oil is there to help! Also, RPO goes straight to the liver- instant energy that doesn’t need to be processed more before getting used as energy. Easily metabolized foods are like paying cash, giving you instant energy. Alas, foods that like to turn to fat are like credit card debt: Easy to take on, but paid back with interest (or, lots of exercise and hard work). You pay a “fee” for having eaten it; since it got stored as fat instead of getting used as instant energy, you have to “pay” to get it back out of storage, before you can use it for energy! 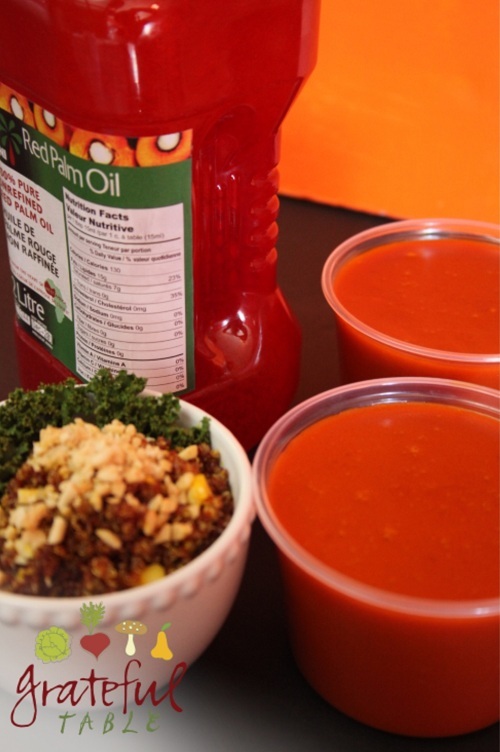 If you’re ready for this serious super-food, find a good, sustainable oil, like this Red Palm Oil (100% Organic) . From an environmentally sound source, it’s grown by small groups of farmers in West African villages. Unlike the refined stuff we become accustomed to (that is so easy to eat to excess), virgin RPO has a curious, rather strong flavor. To make it more palatable, I always use other strong flavors with it, like garlic and spices. Which are super good for us too, so that’s just fine!